Instagram - StudioDQSince 2000, when Petra introduced the Nordics to ‘exotic’ training she has been passionate about teaching others this great form of exercise. Owner of Studio DQ as well as one of the founders and President of the Swedish Pole Dance Federation and the Nordic Pole Federation she now dedicates time to help others start up. Petra is also a published author and an international judge. Member of COMPLETE. Own production SIRI with COMPLETE at DANSENS HUS. 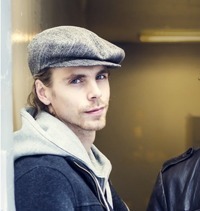 Fredrik Rydmans SWANLAKE as the main character Rothbart both in Sweden and on a Europe tour. Choreographed Danny Saucedo and Hanna Lindblad for the Swedish Melody Grand Prix and Loreen on Swedish Summer tour. Danced in Bounce Production LAST BOUNCE, CUATION and INSANE IN THE BRAIN. Danced 2 Productions with OSLO DANCE ENSAMBLE. World Champion in LINDY HOP and BOOGIE WOOGIE. 3rd place in SO YOU THINK YOU CAN DANCE Scandinavia. Danced and Choreographed in diverse Shows, TV shows and musical like Westside Story, Wallmans , Friends arena Opening etc. Alessandra Marchetti’s gymnastics career started in artistic gymnastics at five years old, but at ten years old she fell in love with classic dance. She began her study at “Balletto di Roma”, one of the most important and prestigious classical dance schools. Alessandra has competed aerobic gymnastics. She did mixed pairs with her husband, and the duo became runner up (2007-2008) in Italy, and in 2009 were in 7th position on the Suzuki World cup in Tokyo (Japan). In September 2010, at 35 years old she started to train pole. In September 2011, in her 2nd competitionshe she became Italian Pole Champion! Alessandra won the Pole Sport Championship in London 2013 and is the current World Champion. World Pole Sports Championship (IPSF) Winner, 2nd in Pole Dance Cup in Poland, Special Prize for Best Choreography in Pole Dance Cup in Poland, the list goes on and on. Alex came as a street dancer and adapted to the pole with a bang. Who hasent seen his flips from the pole on you tube. We hare happy to see him for the first time on a stage in Sweden! Don't forget to book one of his incredible workshops, read more on his site. Alex won the Pole Sport Championship in London 2013 and is the current World Champion. Since we last meet Bendy she has placed 2nd in the WPSC2013 and won the UK Professional Pole Elit Championship (amongst other things) she is still a an innovative pole artist, acrobat, aerialist and handbalancer travelling the world teaching and inspiring others. Kate is now 23 years old and trained as an acrobat from a young age. Since beginning pole she has won several pole fitness titles including the UK Professional Champion 2011, 2012, UK Amateur Champion 2010 and World Doubles Pole Runner up twice. Add now adding runner up in the WPSC2013 to her list. Davide has been a titled gymnast since 1982, a certified fitness instructor from 1996, gymnastic coach (Italian Federation of Gymnastic) personal trainer, coach of the national team of Pole Sport FISAC-POLEXGYM (Italian Federation of Sports Acrobatic and Choreographic), EPSU international judge and an aerobic gymnastic national judge. He has judged national and international pole competitions and has been very active in creating a scoring system for the IPSF that is based on a code of points. This position will mean he will be constantly assessing and evaluating how the biomechnics of the body can be safely scored in international and national competitions.